I watched Steel Magnolias a few nights ago and was intrigued by the simple recipe for “Cuppa Cuppa” Cake that the hair stylist, Truvy, is describing at the beginning of the movie. It sounded so simple and so good, I decided to make one for TeaTime Tuesday. What could be more perfect than a bit of “cuppa” cake for teatime? Preheat oven to 350 degrees F. Generously butter a square, glass cake pan (8×8) or a deep dish, glass pie plate. Combine flour, sugar and fruit cocktail with the juice until just moistened and evenly mixed. Pour into buttered dish and spread evenly with a rubber spatula. Bake until golden brown, warm and bubbly… 30 to 45 minutes. 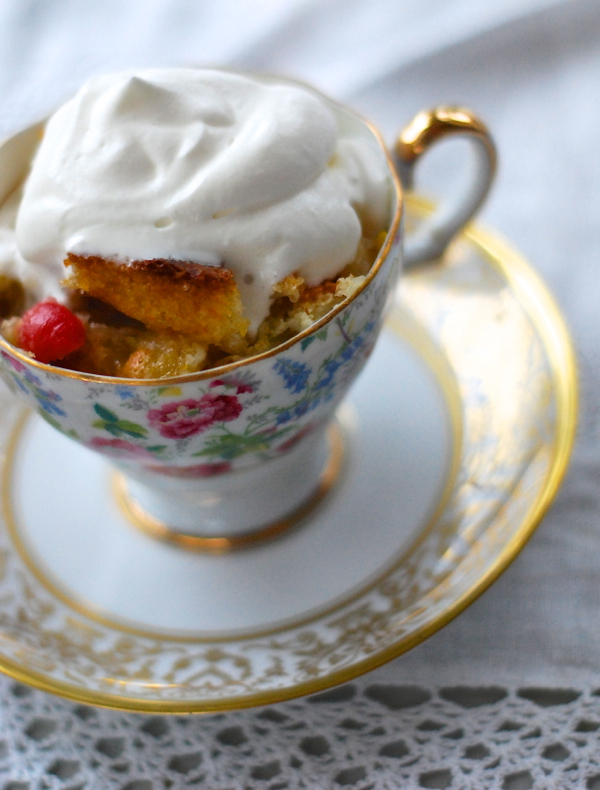 Scoop into teacups and top with a big dollop of the unsweetened whipped cream. absolutely glorious! thank you for sharing with us…. Just lovely, Melissa! I don’t know why I haven’t thought about making this. i’ve seem Steel Magnolias ,ore than once! Yes this is really sweet but oh so nice. We’ve made it for years here. I substitute canned peaches for fruit cocktail and it is heavenly. I must try this. Love the idea of serving it in a teacup, especially for a Steel Magnolias creative challenge I am hosting right now. Doesn’t matter if it’s a boy or a girl, we’ll name them Shelby. My bff is my daughter Shelby. Love this post and obviously LOVE this movie. xo my friend.